26.7.1931 - 26.3.2019 Born Dumbleyung. Much loved Wife of Ronald (dec). Treasured Mother of Tanya, Louise, Katrina, Anthea and Sophie. Grandmother of 11 and Great Grandmother of 3. Beloved Sister of Margaret. 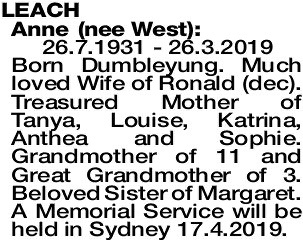 A Memorial Service will be held in Sydney 17.4.2019.